Specialising in B2B data, the team of Blue Sheep engineers developed a solution that supports the data insight and marketing activity of UBM EMEA, has daily updates and safeguards customer information. Using the newly developed solution has resulted in a great improvement in UBM’s data quality, has added industry validation and suppression tools and has enhanced UBM’s data using Blue Sheep’s UK Business Universe® product. Thanks to multiple data feeds from its internal and supplier systems and a number of APIs to integrate their key systems, UBM EMEA has achieved greater customer segmentation and insight to support its marketing activity. 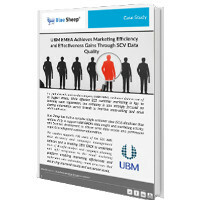 To read the full UBM case study and discover how a Single Customer View solution can increase efficiency, save time and improve brand engagement click here.